RIDGID introduces the 18V OCTANE Lithium-Ion Cordless Brushless 1/2-Inch Hammer Drill Kit with OCTANE Battery, Charger, and Contractor's Bag. The 18V OCTANE Lithium-Ion Cordless Brushless 1/2-Inch Hammer Drill Kit features high performance brushless motors and advanced electronics that provide Best-in-Class power and intelligence. While providing increased performance with all RIDGID 18V batteries, OCTANE tools provide maximum performance when paired with OCTANE batteries. Paired with the 3.0 Ah OCTANE battery, this tool gives an Industry Leading 1,300-Inch/lbs. of torque and over 65% more power when needed for high demand applications. This means, under heavy loads, the tool talks to the battery to determine when to draw maximum power to the motor, allowing the tool to increase performance and finish the task. With registration, this tool is backed by the Industry's Only Lifetime Service Agreement: FREE Parts. FREE Service. For LIFE. The patented Blueair Central Whole House Filter System offers a breakthrough in design and instantly converts a central heating or air conditioning system into a highly efficient, cost effective air purifier without the need for using an expensive, whole-house air purifier system costing thousands of dollars. The system combines the Blueair MX2 Particle Charger with the Blueair Custom Furnace Filter. The Blueair MX2 Particle Charger transfers a safe negative charge to airborne particles as small as .01 microns. The filter is made of millions of fibres, acting like super magnets attracting and capturing (the charged) airborne particles at a rate similar to the expensive systems. The patented Blueair Central Whole House Filter System captures over 99% of airborne contaminants like dust, pollen & dander in just minutes, as well as up to 99% of even the smallest particles including bacteria, viruses and mould spores. The DEWALT FLEXVOLT DCS575T2 60V MAX* 7-1/4-in Circular Saw Kit with Brake comes with a 7 1/4-in full size blade for corded capacity. The 60V brushless motor delivers the power of corded with the portability and convenience of cordless. The electronic brake stops the blade after the trigger is released. The versatile bevel cut capacity is up to 57 degrees with stops at 22.5 and 45. Includes: DCS575 7-1/4-in Circular Saw, (2) DCB606 60V MAX* FLEXVOLT, 6.0Ah Battery, Fast Charger, Blade, Blade Change Wrench, and Kit Bag. The Ridgid 18V Cordless Lithium-Ion Drill Kit features a 4-pole open-frame motor that delivers 455 inch lbs. of torque for a powerful performance. This drill has a 24-position clutch and a two-speed transmission that helps match the power to the task at hand, and the 1/2-inch single sleeve ratcheting chuck provides a locking mechanism to securely hold bits in place during high-torque applications. Plus, the convenient grip light helps you illuminate dark spaces while you work. RIDGID introduces the 18V OCTANE 9.0 Ah Lithium-Ion Battery and Charger Kit. This battery provides up to 8X runtime over standard lithium-ion batteries. With OCTANE functionality, these batteries communicate with RIDGID OCTANE tools to deliver maximum performance in high demand applications. With Bluetooth technology, these batteries open up the jobsite to new levels with abilities to set push notifications, security features, and battery status updates. This battery and charger kit is backed by Industry Leading Lifetime Service Agreement and includes an 18V charger and an operator's manual. 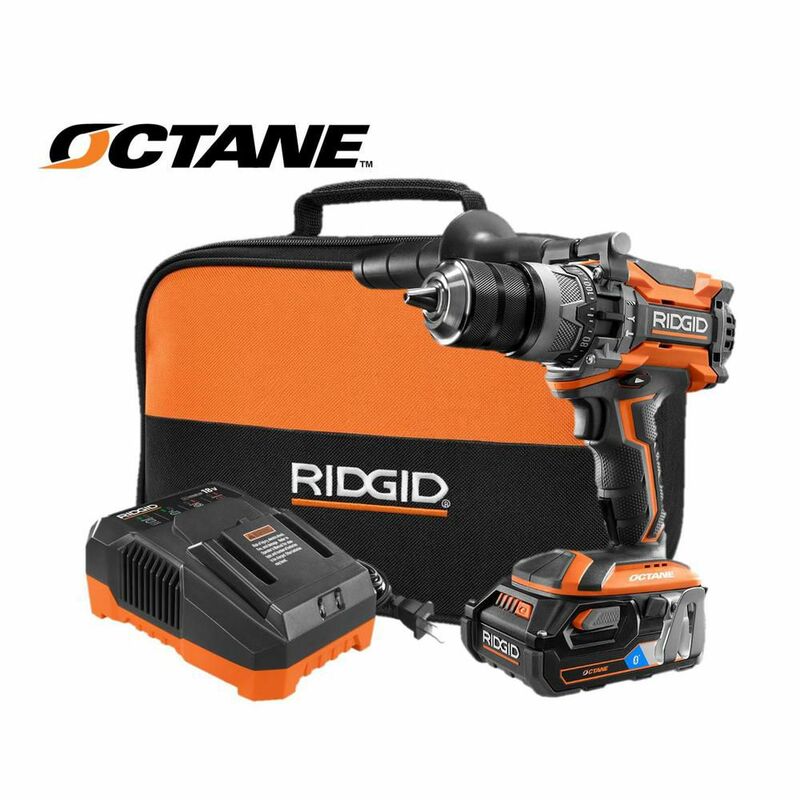 18V OCTANE Brushless 1/2-inch Hammer Drill Kit with OCTANE Battery, Charger, and Contractor Bag RIDGID introduces the 18V OCTANE Lithium-Ion Cordless Brushless 1/2-Inch Hammer Drill Kit with OCTANE Battery, Charger, and Contractor's Bag. The 18V OCTANE Lithium-Ion Cordless Brushless 1/2-Inch Hammer Drill Kit features high performance brushless motors and advanced electronics that provide Best-in-Class power and intelligence. While providing increased performance with all RIDGID 18V batteries, OCTANE tools provide maximum performance when paired with OCTANE batteries. Paired with the 3.0 Ah OCTANE battery, this tool gives an Industry Leading 1,300-Inch/lbs. of torque and over 65% more power when needed for high demand applications. This means, under heavy loads, the tool talks to the battery to determine when to draw maximum power to the motor, allowing the tool to increase performance and finish the task. With registration, this tool is backed by the Industry's Only Lifetime Service Agreement: FREE Parts. FREE Service. For LIFE. 18V OCTANE Brushless 1/2-inch Hammer Drill Kit with OCTANE Battery, Charger, and Contractor Bag is rated 4.9 out of 5 by 45. Rated 5 out of 5 by Adi from Great drill with good ergonomics and built quality. Battery delivers... Great drill with good ergonomics and built quality. Battery delivers plenty of power without being too heavy. Would definitely recommend. Rated 5 out of 5 by jef from The RIDGID 18v Hammer Drill Kit has all the features... The RIDGID 18v Hammer Drill Kit has all the features I need to address needs where a corded equivalent tool would be impractical. RIDGID addressed main concerns regarding cordless tools by standardizing the battery types for all their cordless tools and including free replacement of the battery. Rated 5 out of 5 by Zoocrew from This is a great addition to my collection of rigid... This is a great addition to my collection of rigid tools . I own several rigid tools and swear by the reliability and quality of each and every one of them. Rated 5 out of 5 by Dave from Best tool ever made!!!!! Best tool ever made. You'll never need another drill ever again. This is the most powerful drill I have ever used and I am a licensed contractor. I definitely recommend this tool. You will not regret it!!!!!!!! !